Touchscreen technology is about to change in a big way and TechRadar managed to get a glimpse at just what will be in smartphones and tablets in the very near future. Sharp may have been all about big-screen TVs on its stand, but it was the smaller screen tech that caught our eye the most. IGZO isn't just a gimmicky name, it comes from the materials that make up the screen tech - Indium, gallium, zinc, oxide. The tech hit the news back in July as it was rumoured that the iPad Mini, if it ever rears its small but perfectly formed head, will come with an IGZO LCD. Sharp hasn't shown the technology off before in Europe, so we decided to get up close and personal with it at IFA 2012. And we have to say, the technology is mind-blowing. It's sharper than current screens and offers something that has been long-needed in the smartphone and tablet world – a low-power screen solution. Essentially, where touchscreens at the moment require juice to keep them active, IGZO can lay dormant, sapping up hardly any energy at all, until it is pressed. And when it is pressed, it is so precise that you will be able to use styluses that are as thin as a pencil point.Or do away with the stylus and just use a pen or pencil. A spokesperson told TechRadar that we should see this screen technology this year in devices, as it is ready to ship now, but couldn't tell us which manufacturers were going to use – so we will leave that up to the rumour mill. 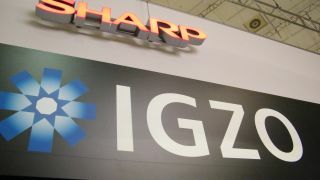 We did find out that Sharp has been working on IGZO for the past 10 years, though, so a lot of R&D has gone into the technology. The technology may be for the small screen at the moment, but there's no reason why we won't see IGZO used in televisions in the future, something that was also hinted at by the Sharp spokesperson. A new version of IGZO was also shown off on the stand, one which boasts 498ppi. Considering the Retina Display is 326ppi, it's fair to say the images displayed were jaw-dropping. If the rumours are true, we can't wait to see what Apple does with this tech.